How to secure a FTP connection when uploading log files to OnCrawl? When you connect to a website and need a secure connection, you make sure that connection is established in HTTPS and that it is secured with a valid certificate (represented by a green lock). the connection is encrypted in a secure channel, with SSL or TLS. How to enable FTPS with my FTP client? Some FTP clients will try to establish a secure connection by default. 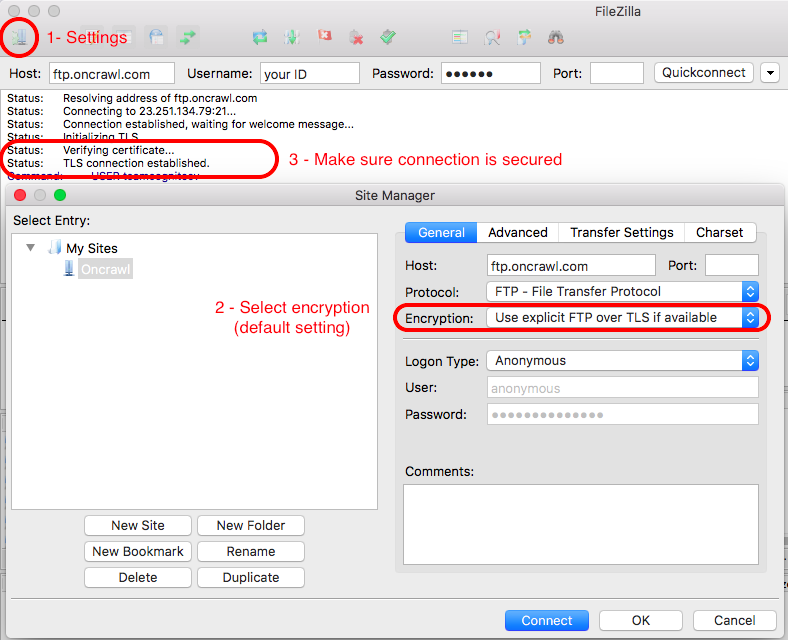 If your FTP client does not use TLS by default or you do not want to take the risk to send your password in plaintext, then you want to turn the option "Explicit FTP over TLS". This option will force the client to establish a secure connection, and the connection will fail otherwise.